Julia has been a student of the game of softball for many years. She played high school and travel ball out of San Antonio, Texas, and went on to Methodist College in Fayetteville, NC. “Having played travel and high school ball in Texas, I was always told I would never amount to anything. I worked hard and continued to study the game, and became a standout in college, leading the nation in doubles and hits in my Sophomore year at Methodist University. 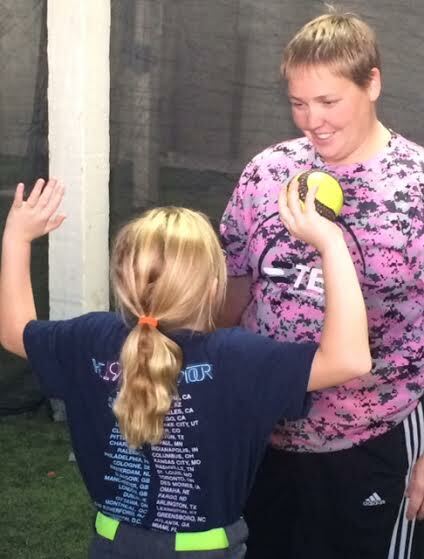 I have always told the kids I coach that they can do whatever they choose to do, and not to let anyone tell them otherwise.” Having this mentality has made it easier for Julia to transition into Fluid Dynamics and continue the learning process that is ever changing in today’s softball world. Julia has won many softball accolades along the way, to include being a NCAA statistical champion in several categories her sophomore year of college. She is always open and willing to make the changes necessary to improve a student’s movement and attitude. “A fierce attitude with the strong will to make yourself better is a great attribute for anyone to have, especially a softball pitcher.” Julia taught herself how to pitch in high school when she was told she would never amount to anything as a pitcher. She went on to play in college as a utility player and pitcher. She was first team all-conference 3 of her 4 years in college, and NFCA 2nd Team All-Region in 2000 as well. She still holds many of the season records and career records at Methodist. Julia currently lives in Stokesdale, NC, just north of Greensboro, NC with her husband, Rick and two children. She still coaches, but her focus has now shifted to the younger crowd. And here is what Denny has to say about Julia: We enjoy Julia so much. She is funny, fun, enthusiastic, and she comes into the facility ready to hit the ground running. She also has another side. She is obsessed with seeing kids succeed. She pours a lot of energy into each session and keeps coming at things from different angles until she finds the approach that works just right for that individual. That is a quality we encourage in Instructors.